Play can include a calm, quiet, destress space for kids. One parent’s wish is giving the rest of us something to think about for at school and at home. This month, blog posts are based on answers to the question, “If you had one wish for a preschool or kindergarten or other childcare program left-over from St. Patrick’s Day or a sort-of realistic magic wand you found on April Fool’s, what would you want?” Answers have been varied and really interesting. This wish for a quiet place for kids come from L-A, a mother of two and kindergarten teacher. Do kids need a quiet retreat at school and at home? Absolutely. Just like adults. What about you? Do you have a place where you can go when you are feeling overwhelmed? For parents, sometimes it’s locking yourself in the bathroom for a few minutes. At work, it may still be a bathroom or even a storage closet. Anything for a few minutes where the phone isn’t ringing or someone is stopping by your counter or desk. We take coffee breaks, but that’s not the same as a quiet break. We might expect a calm, quiet space for kids to have dim lighting, soft cushions, furry stuffed animals, and books, but many of them also include sensory materials. A spongey ball, lava lamp, heavy blanket, and squishy playdough are possibilities. 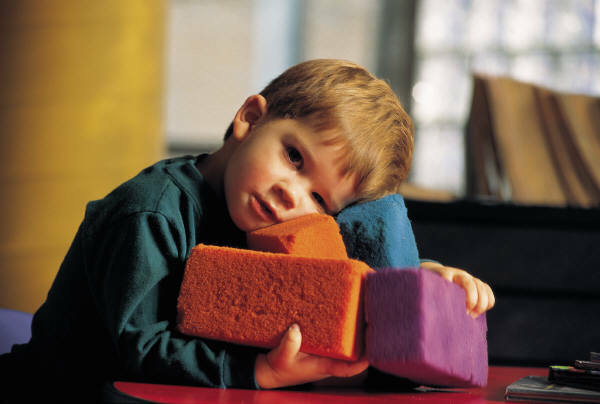 Carolyn Feder shares some suggestions in her article Top Ideas to Create a Calming Sensory Bedroom Space for Autism Parenting. At home or in a care or school center, we may be able to find a room or a corner to make a retreat. Sometimes, a big box or small tent is an option. 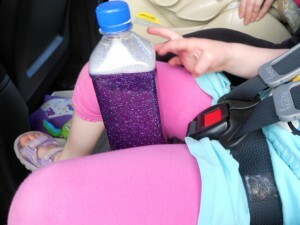 In the car, this can be quite tricky. A super article gives a list of 40 items you can use to make a calm-down bin. For kids that find public spaces like stores or offices a challenge, you can tuck a few into a bag to take along. No wonder a quiet place for kids is a wish from this parent. Is there a calm, quiet, destress space for kids at your house or childcare center? Sensory bins are a wonderful play experience for kids that stimulate the senses and encourage children’s development and learning in a number of ways. Halloween sensory bins can be made with a variety of objects, such as plastic skeletons, witches, bats, and other toys, fuzzy pompoms in black, yellow, and orange, squishy snakes and spiders, slippery gel beads, etc but we made a very simple one with a container of warm water and a dollar store package of googly eyes, along with some scoops, tongs, and spoons. 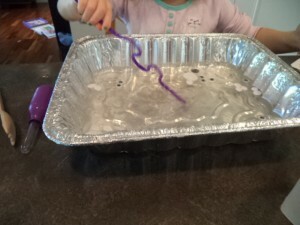 The instructions for making this sensory bin, are as simple as the ingredients. Pour some warmish water into a container, find some tools in the kitchen drawer, dump in a few googly eyes and let kids play. This googly eyes and warm water play engaged a 3 year old and a 6 year old for over an hour! 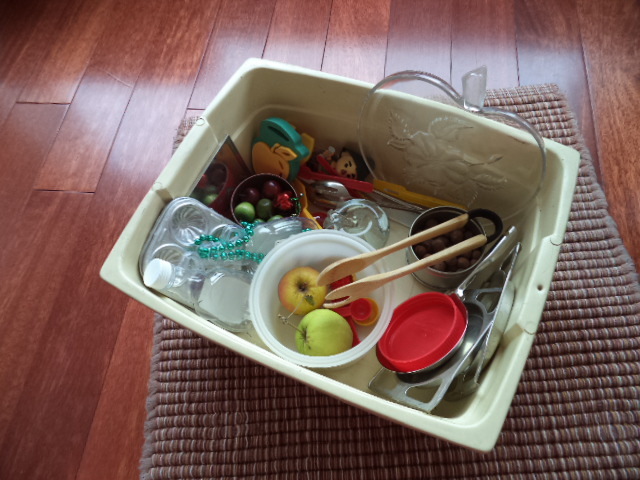 Instead of one big container for both kids, they each had their own and their own set of tools. They played in different ways but also talked to each other as they made discoveries they wanted to share. They scooped the eyes out and lined them up on the table, gave them baths, tried to pick them up with the tongs and spoons of various sizes, pushed them over to one side and then the other, turned them all over so the eyes could see up, and more. It was delightful to watch and hear how they played. They had conversations with the little bits of white and black plastic that are used to make googly eyes. There was a tremendous amount of play happening such as eye-hand coordination (tee-hee) and small muscle development, using language, making choices, taking action, imagining, and more. Water is calming, which is very helpful with the excitement building for Halloween, and certainly a sensory experience. Could this play activity be a treat for your child? Putting together a sensory bin for your child can be intimidating! There are some amazing ones on the internet that, by comparison, make me green with envy and red with embarrassment. But, the idea of a sensory bin is to put some simple items together that invite kids to play. Remember, kids will play with anything. With that in mind, I was able to find some things that the kids liked, plus I had fun making a bin. Many sensory bins will use something small like rice, lentils, oats, garbanzo beans, pasta, or wooden beads for kids to measure and pour, sort of an alternative to sand. Another day, I may add something like that but to start, there were some small metal baking dishes, plastic utensils such as spoons, flippers, and spatulas, a container of clay pellets left over from some plant pots, beads, plastic jars, bamboo tongs, various sizes of plastic jar lids in red, yellow, and green, an apple paper weight, small wooden apples, and two real ones. Both kids are beyond the everything in the mouth stage, so some of the objects were quite small. Big Sister used the things in the bin for lots of imaginative play, making things to eat, pretending she worked in a bakery where she made goodies that she sold to Little Sister. Little Sister had a very different sort of play, putting the small objects in the container and stirring or pouring them. She carefully put the string of beads into the skinny jars then tried to pour it out. She made a few attempts to get them out, then put the jar aside and played with something different. Both of them spent several minutes with the one pair of tongs, picking up the small wooden apples. Since there was only one pair, they had to negotiate who would get them, which they did, more or less. Children will play with objects in their own way. Some children may only spend a few minutes with a sensory bin the first time, going back to it often throughout the day. Others will find many different ways to play and be fascinated for a long time. This will depend on their needs and moods. However they play, they will be having fun and learning at the same time. Have you tried some sensory bins for your child?